Coral Top & A Trip To Next! So Thursdays = gymnastics for one of the twins. It started out with both doing it and then one decided she'd had enough (only after I'd paid for a second term! But they took pity on me and I got a credit for next term) so now every Thursday, I spend an hour with just one of the girls. Which is actually quite nice...not just from a twin perspective. It's just lovely to spend one-on-one time with a single child when you have more than one competing for your time. And thankfully, she's a good shopping buddy...and she's the one who's always happy to take photos. After she took my pics, we headed to Next on a sunhat hunt. I'm the bad mummy who leaves it until we've had a few weeks of proper sun before accepting that last year's hats are too small. I picked up the last two girl's sun hats left, which lucky for me were the same (no arguments) and featured Hello Kitty (guaranteed to be worn). Then it was time for a quick scoot around to see what caught mine and my little shopping buddy's eyes. Next has really upped its game over the last two seasons and I can rarely go in now without seeing 2 or 3 things I'd like to buy. 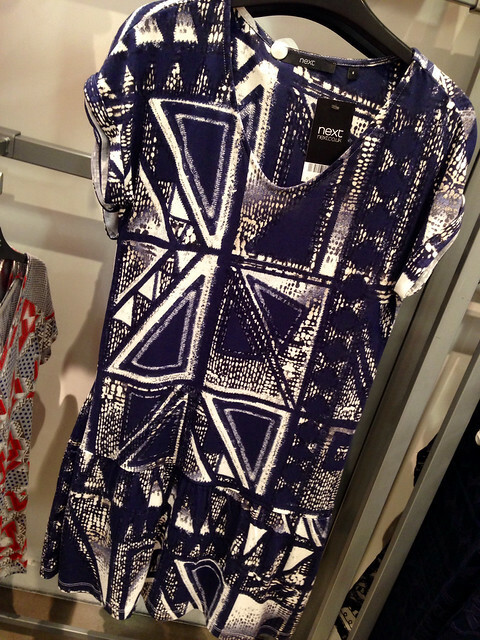 First up, I adore this print - really bright and perfect with denim, white or coloured jeans or shorts. It's got a zip fastening at the back, which I really like as I find buttons on the neck (as with the Boden top I'm wearing) really fiddly to close. 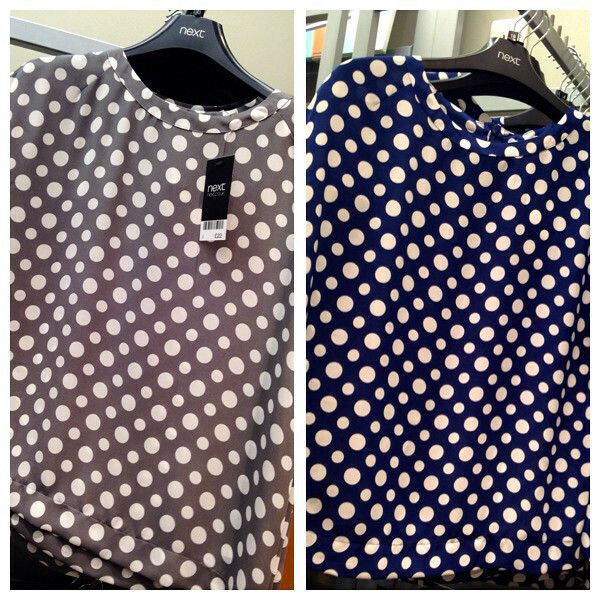 The same top also comes in both of these spotty patterns - loving the grey especially! These simple jersey dresses are so simple to throw on for holidays. The pattern is flattering and in one fell swoop, you're dressed! It also comes in a few plain colours too and would work with leggings if it feels a bit short. 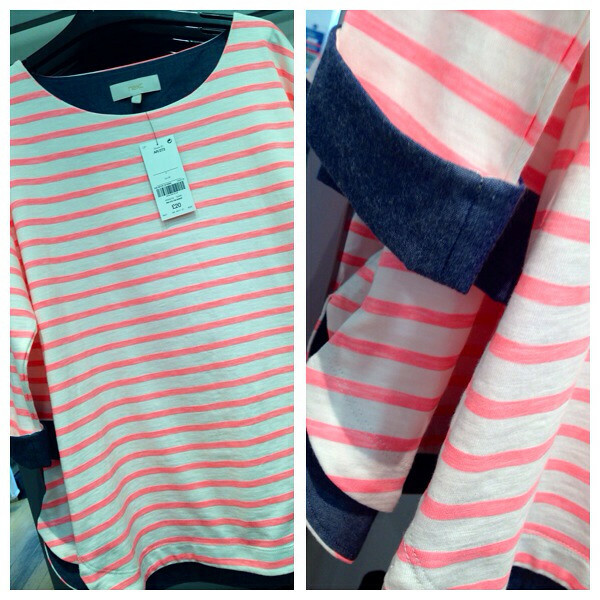 Loved this breton oversized sweatshirt - which has a cute denim detail on the inside seams and the sleeves. See...coral colours again! Can't find it online but it was only £20 and was quite a nice weight. This bag stopped me in my tracks. It's amazing and if I'd not already got my Dune one recently, I'd have bought it in a flash. 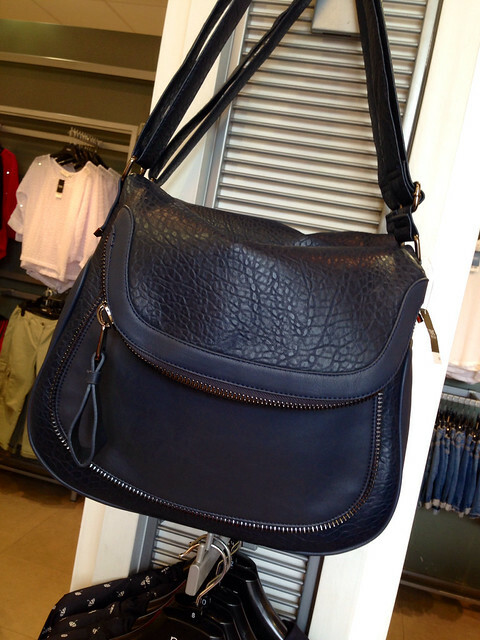 It's the most fab shade of navy and is one of the best leather look materials I've seen in a long time. Perfect size, great strap length for easy wearing and a nod to Anya and Chloe...all for £34! 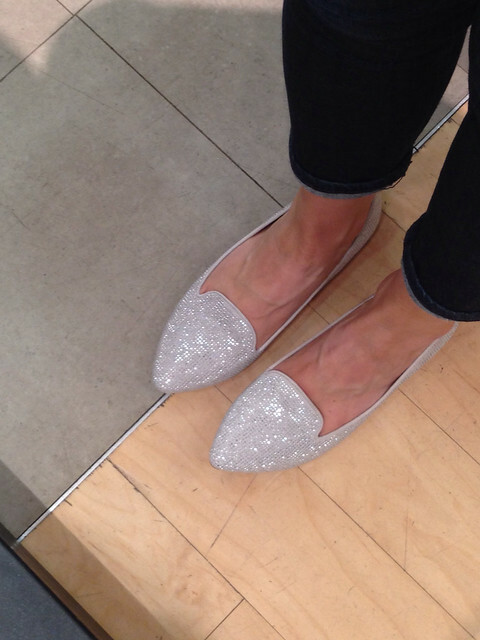 I loved these sparkly pumps too - again, super comfy. Not something I used to associate with Next footwear. And then - my undoing...the item I can't stop thinking about since I left the store. COMPLETELY impractical and unnecessary for every occasion in my life. But I just love them. The asymmetric cut, the metallic colour that will totally match everything, the comfort, the fit..and the price! But I do NOT need silver stilettos in my life...I have many many pairs of going out heels that I rarely wear and when I do, send me to physio or require me to take painkillers for a week afterwards - my back does not like super high heels. To take my mind off them, I decided to buy one of the items I photographed....I'll share it on the next post! It might be the outfit I wear when I go back to Next for a second look......shoes can be ornaments, no? 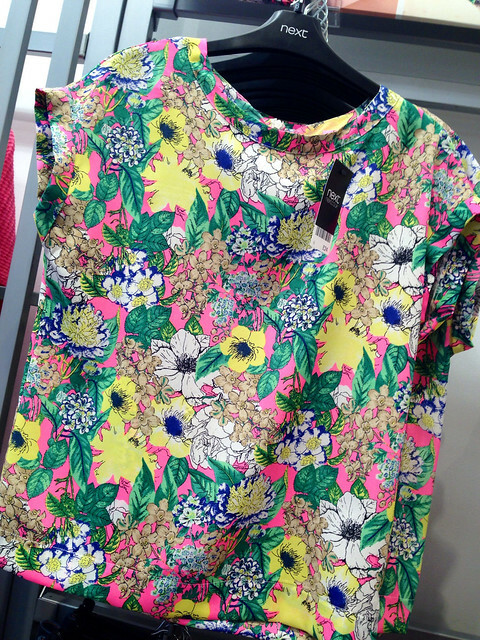 I have the neon floral top from Next, it's really comfortable and doesn't crease. Looking forward to wearing it with my white jeans this sunny weekend! I love the silver shoes on you but my sensible head would tell me to go with the white slides and make the most of the summer in them. They are super comfy as I was toying with them last week until I settled on my Pieces slides. And I am not allowed to buy any more shoes now. Self imposed ban - I have been rather bad lately on the shoe front. Having said that, there is a pair of silver shoes in Next that I have got my eye on. If not this month … maybe next! Avril, I bought a pair of expensive sparkly silver slingback shoes about 8 years ago, for no good reason other than I loved them, but they have been the best purchase...go with everything and put on an almost every wedding, night out, formal etc. I have also had the gym split with the boys! Ben goes in but Alex said no more! ADORE the coral top. I think Natalie wore it to London when we all met? I don't think I would have been able to leave the metalic heels behind! BUT .. like you, I wouldn't wear often and think as a trend they have a short shelf life. I love Next at the moment too! Great finds in Next at the moment, they have certainly upped their game, love those silver heels, my bunion aches just at the thought of wearing them - fab though! I have the same coral jacquard from Boden, but in dress form. It definitely worked well for me on so many occasions, like weddings, subbing, church. You do look really good in coral!!! What a great round up Avril, I liked everything you featured, that bag is amazing, and the shoes, you are right Next seem to be doing everything right at the moment. 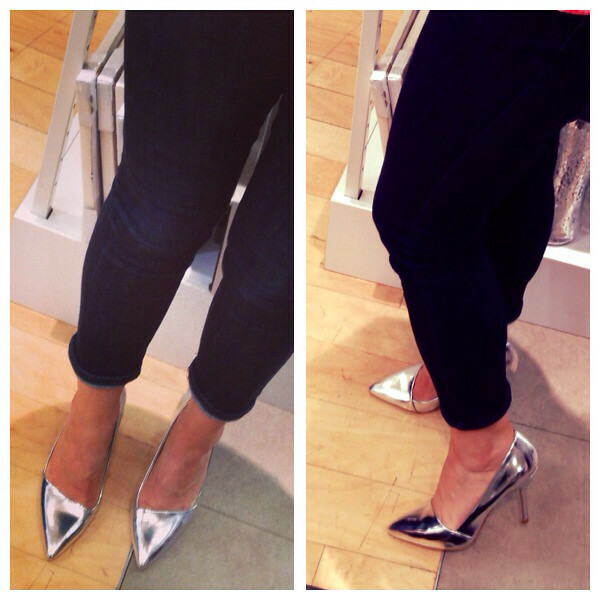 I'm quite tempted by the silver heels, nearly bought some from ASOS a while ago, but then they sold out. 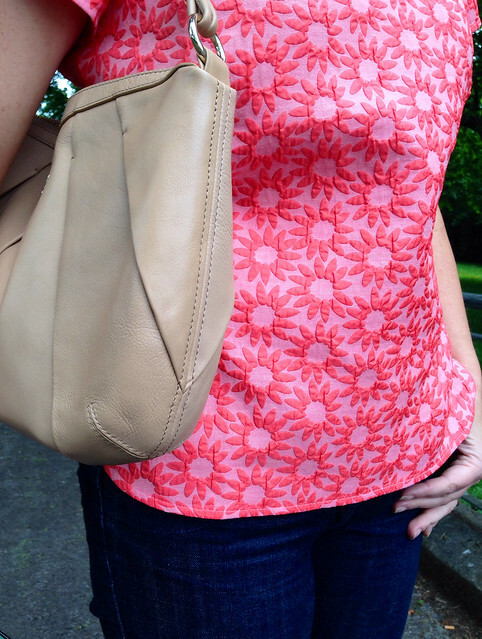 Looking fab in your coral top! Oh those silver shoes are just gorgeous! I can see why you're tempted. I'm also trying to figure out what you've bought and am torn between the grey spotty top or the coral breton.?? I haven't really had a look in Next recently, but from your post, it looks as though their sale might be worth going to this year. NYC - What I Bought & A GIVEAWAY! NYC - What I Wore!